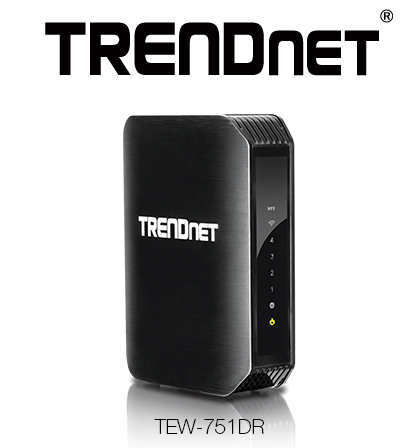 TORRANCE, Calif. -July 15, 2013- TRENDnet, a best-in-class wired and wireless networking hardware brand, today announces the availability of the N600 Dual Band Wireless Router, model TEW-751DR - which offers an attractive mixture of wireless dual band performance and value. Manage two 300 megabit per second Wireless N bands - a 2.4 gigahertz band for your everyday devices and a less congested 5 gigahertz band to stream HD content. For additional security, the router's wireless network comes pre-encrypted. A handy guest network can restrict guest access to the internet only, thereby shielding personal content on a network from guest wireless users. Hardwire computers, printers and storage drives to the four Ethernet ports on the back of the router. The TEW-751DR is also environmentally friendly, with up to 50% GREENnet technology energy savings. "If you're looking for a performance oriented dual band router at a reasonable price, take a closer look at TRENDnet's TEW-751DR," stated Sonny Su, technology director for TRENDnet.